So the U.S. House tax bill proposed finally eliminating tax-exempt bonds for sports stadiums three decades after Congress accidentally left in a loophole about it, and the Senate version of the bill didn’t have that provision, and who could possibly guess how the two would end up reconciled? The bill keeps a provision that allows the use of tax-exempt bonds for stadium projects. It would have been eliminated under the House version. Since 2000, the federal government has subsidized sports stadiums to the tune of $3.7 billion, according to a recent study by the Brookings Institution. 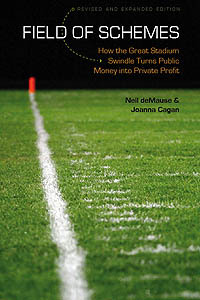 Yeah, as I was afraid of, the 31-year-old provision allowing federally subsidized tax-exempt bonds to be used for private sports stadiums so long as team owners jump through a few easy-to-jump-through hoops was revived by the House-Senate conference committee, surely not because any of them got any calls from any NFL lobbyists. This means that team owners will continue to be able to get lower interest rates on stadium bonds thanks to federal taxpayers footing the bill for the difference, which makes no damn sense but sports leagues like it so there you go. A cynical mind would be tempted to speculate — did speculate already on Friday, in fact — that the whole House bill to crack down on stadium tax breaks was just red meat to throw to libertarian types in the GOP and anyone else who’s pissed off about sports subsidies, and House Republicans knew that their Senate counterparts would rescue them by eliminating the bill so they wouldn’t have to answer to an angry Roger Goodell. Regardless, looks like Mark Davis’s Las Vegas Raiders stadium bonds are safe — taxpayers in the rest of the U.S., hope you’ll enjoy your federal taxes helping to pay for Davis’s new home, because you’ll be doing so to the tune of $100 million. Friday fun: Draw your own Rays stadium, Pacers make money hand over subsidized fist, and more! UC Berkeley is going to bail out its terrible football stadium deal with non-athletic department funds, though it can’t say where exactly the money will come from other than that it won’t be student tuition or state tax dollars. You guys, I’m starting to worry that UC Berkeley may have a lucrative meth-lab business on the side. The University of Connecticut is spending $60 million on three new stadiums, which it will presumably totally pay for out of student tuition and tax dollars. The NFL is opposed to the language in the GOP tax bill that would ban use of tax-exempt bonds for sports stadiums, because of course it is. “You can look around the country and see the economic development that’s generated from some of these stadiums,” NFL spokesperson Joe Lockhart said with a straight face, either because he doesn’t understand that any sliver of economic development in one part of the U.S. from stadiums just comes at the expense of economic development in another part, or because it’s what he’s paid to say, or both. Meanwhile, speaking of that tax bill, there are a lot of reasons to be terrified of it, even if that stadium clause would be nice. A website commenter got sick of waiting for the Tampa Bay Rays to issue stadium renderings and drew some of their own, getting on SBNation for it despite having failed to find the Fireworks menu in their CAD program. No, I don’t know why it has an apparent non-retractable roof, or how people in that upper deck in right field will get to their seats, or what’s holding up those seats, or lots of other things. FC Cincinnati president Jeff Berding says a stadium announcement is scheduled for next week and that it will involve Cincinnati Mayor John Cranley, so presumably the team owners are now focused on building in Cincinnati instead of across the river in Kentucky, using Cincinnati’s tax kickbacks instead of Kentucky’s. Poor Cincinnati. Okay, sure, figuring out how exactly this bill’s passage would affect the Raiders stadium costs is complicated. Figuring out roughly how much it would affect it, though, is dirt easy: Tax-free bonds typically allow an interest rate 1-1.5% below taxable bonds. So adding that much to the financing costs on the state’s where to buy lorazepam online 0 million would mean an extra $7.5-11.25 million a year, which over 30 years, converted into present value … I get between $115 million and $173 million worth of added interest costs. So that’s a hefty chunk of change, and the big question would be who would pay it: The state or Raiders owner Mark Davis? That all depends on what it says in the team’s stadium lease — and in all likelihood it just says “we’ll use tax-exempt bonds,” meaning the whole thing would need to be renegotiated to settle who’d be on the hook for the extra cash. That would certainly be interesting. To recap briefly for anyone who hasn’t been reading this site: In 1986, Congress tried to rein in the use of federally tax-exempt state and municipal bonds — basically a funding mechanism by which local governments can get lower interest rates by fobbing off some costs onto the federal government — by prohibiting their use for any projects where more than 10% of the use would be by a private entity, and more than 10% of the cost would be paid for with private dollars. The idea was to allow tax-exempt bonds for projects that genuinely needed the help — public parks, say — but preventing cities from just sticking federal taxpayers with part of the bill for private projects that could pay their own way. To say that this failed would be a massive understatement. Local governments immediately started upping their public contributions to stadium and arena projects to keep the private share under that 10% limit — and where that wasn’t possible, they resorted to shenanigans like accepting private payments but pretending they were public tax money. The result has been $3.7 billion in federal subsidies to sports facilities since 2000, according to a Brookings Institution study; it’s this provision that has meant that Red Sox fans living in Boston helped pay for a share of the New York Yankees‘ new stadium. Rep. Dennis Kucinich proposed prohibiting sports stadiums from using the tax-exempy bond dodge a decade ago, then President Obama did the same in 2015, then Senators Cory Booker and James Lankford did it earlier this year, and finally President Trump hinted at it (in retaliation for NFL players taking a knee during the national anthem) last month. But only now are we seeing actual legislative language for outlawing tax-exempt stadium bonds in a bill that might actually be passed. Whether it will, in this form, is anybody’s guess: The House could still strip the stadium language before passing the tax plan, or it could be eliminated in the Senate version of a tax bill; you have to figure that sports league lobbyists are working the phones hard this morning. Even if it does pass, it won’t eliminate sports subsidies by any means — state and local governments will still be welcome to throw their own money at team owners, and they would almost certainly seek out loopholes by, say, trying to use tax-exempt bonds to finance all the parts of a stadium project not used for sports. (An attached food court isn’t really “used for games,” right?) But it would at the very least close a 31-year-old loophole that even the guy who wrote it into law wanted repealed, which would be a start, anyway. Trump scares NFL with tax break threat, but will he do anything real about sports subsidies? So Donald Trump’s tweet yesterday threatening to eliminate the NFL’s “massive tax breaks” got an immediate response from league commissioner Roger Goodell, who issued a press statement that of course the league believes that “everyone should stand for the national anthem,” and will get right on figuring out how to make players do that without violating collective bargaining laws. The lesson: Sanctions work! And that stadium tax break — if it was what Trump was getting at (even his own press secretary seemed unclear which public money he was talking about) — is only the tip of the sports-subsidy iceberg. Even at $200 million a year, the public cost of tax-exempt bonds is dwarfed by the flood of cash flowing from state, county and city governments to sports teams. Please go read it now. There’s a good bit at the end with David Minge in it. WASHINGTON (Reuters) – President Donald Trump on Tuesday called for changes to U.S. tax law affecting the National Football League, fueling a feud with the league and its players over protests that he says disrespect the nation. So that probably means the tax breaks that come along with tax-exempt stadium bonds, which several other Republicans have proposed rescinding for the NFL if their players keep taking a knee during the national anthem. (A state representative in Missouri has also called for “not investing any more money for stadium funding if the players and billionaire owners are going to disrespect our country and disrespect our state,” which I guess means not paying to renovate the Kansas City Chiefs‘ stadium again?) As is typical with Trump, there are no specifics about what he means, though I suppose I could try tweeting at him to ask if he knows a way to change tax law so that the NFL can’t get tax-exempt bonds but more patriotic sports like, er, hockey can. Anyway, let’s all enjoy the spectacle of Trump and the GOP rushing to embrace a policy that President Obama proposed two years ago, only to be blocked by a Republican-controlled Congress, because they’re mad at players for not standing on the field during the anthem, defying a tradition that dates all the way back to 2009. I remain extremely skeptical that this will lead to any actual legislation, but the universe is so insane right now, anything is possible. Louisiana state Rep. Kenny Havard proposed cutting off state lease subsidies to the New Orleans Saints, which amount to somewhere between $200 million and $400 million over 15 years depending on how you count, on the grounds that “It is time for taxpayers to quit subsidizing protest on big boy playgrounds.” How he planned to do that in a contractual agreement signed four years ago, Havard didn’t say. U.S. Rep. Matt Gaetz (R-FL) declared, “In America, if you want to play sports you’re free to do so. If you want to protest, you’re free to do so. But you should do so on your own time and on your own dime.” Gaetz went on to gripe about the NFL’s non-profit status, which the league already gave up two years ago, though he also noted that “the public pays 70 percent of the cost of NFL stadiums,” which while true wouldn’t actually be affected by any actual legislation Gaetz was proposing. The Daily Signal, which is extremely in favor of “free speech” when it comes to people being guaranteed the right to write conservative student newspaper columns without fear of getting angry emails from readers, noted that upset over anthem protests may “open the eyes of the public to a serious and generally unchecked issue: billionaire NFL owners sponging enormous amounts of money from taxpayers through crony capitalist schemes.” The site then provided a useful list of stats about NFL owner sponging (“$7 billion of taxpayer money” over the last two decades, which it looks like they got from Judith Grant Long’s data via this Huffington Post article), concluding with mention of the bipartisan Lankford-Booker bill to eliminate use of tax-exempt bonds for sports venues, which it said would “strip federal funding from sports teams,” which isn’t exactly right, though it would strip the largest federal subsidy. If anger at players for calling attention to police violence and institutional racism via silent protests leads to new attention to and limits on sports stadium subsidies, that’d be good, I suppose, albeit weird: For one thing, NFL players don’t really benefit from public subsidies except indirectly (team owners get more profits, and use some of that to spend on higher player salaries). And the Lankford-Booker bill on tax-exempt bonds does seem like the most likely restriction on stadium subsidies to have a shot at passage — nobody that I can tell is talking about reviving David Minge’s bill for an excise tax on local-level subsidies, which would actually do something serious about that $7-billion-and-growing nut. Mostly, though, this sounds like a bunch of politicians taking advantage of public anger at football players and at sports subsidies to mash the two up into, “Yeah, let’s hit them where it hurts, see!”, even if there isn’t an exact plan for how to do so. The Lankford-Booker bill still has zero other cosponsors and remains sittin’ in committee; maybe we’ll now see a rush of Congressfolk signing on if the kneeling continues on Sunday, but I’m honestly not holding my breath.